The fifth voyage of Captain Jesamiah Acorne and his bewitching wife, Tiola. Captain Jesamiah Acorne is in trouble. Again. Arrested for treason and smuggling, believing his beloved ship, Sea Witch, lies wrecked on England’s North Devon coast, his only hope of escaping the noose is for someone to quash the charges. That someone turns out to be his ex-lover – but there’s a price to pay. He needs to find a boy who has disappeared, and a valuable casket that more than one person wants to get their hands on. When people start getting murdered and Barbary pirates kidnap his wife, Tiola, his priorities rapidly change – but who is lying about what? Is returning to piracy a wise idea? Is Tiola having an affair with her mysterious Night-Walker ‘friend’? Meanwhile, Tiola has her own battle to fight – keeping herself and Jesamiah alive! 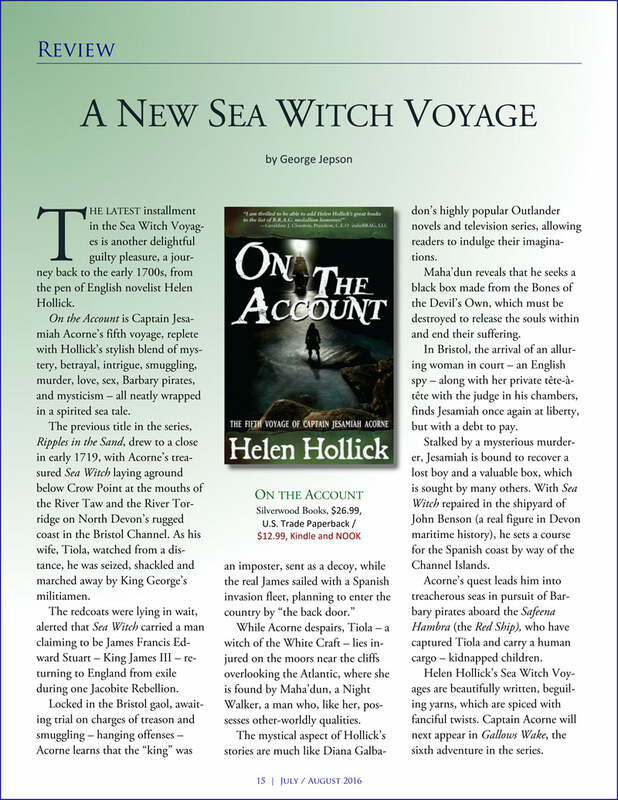 Read about On The Account as 'a new kind of sea witch voyage' in the Quarterdeck Newsletter here.